James 2: 14What doth it profit, my brethren, though a man say he hath faith, and have not works? can faith save him? Do we need to mix our faith with works to be saved? Is this what James was saying in this passage? Salvation, or eternal life with God, is a free gift. A priceless gift. We cannot earn a gift. Unfortunately we are taught from an early age that even the gifts that we receive, have to be earned. This is the message we give to children when we tell them, “be good or Santa won’t come”. So Satan has even associated the birth of our Savior, with earning a gift. If a person were to scrimp, and save their entire life, to give the gift of a million dollars to someone, and that person mowed their lawn or shoveled their walk and said, ” now we are even”, this is somewhat comparable to thinking we can earn our salvation. What then was James referring to? Lets look at the whole passage in context. James 2: 14What doth it profit, my brethren, though a man say he hath faith, and have not works? can faith save him? 15If a brother or sister be naked, and destitute of daily food, 16And one of you say unto them, Depart in peace, be ye warmed and filled; notwithstanding ye give them not those things which are needful to the body; what doth it profit? 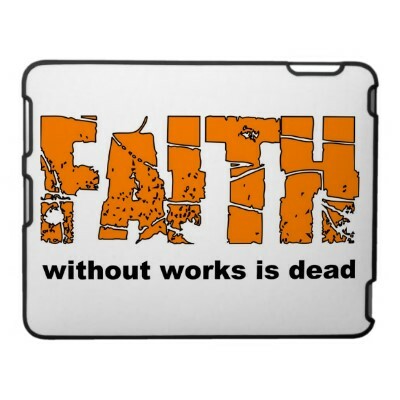 17Even so faith, if it hath not works, is dead, being alone. If we we have faith that God will supply all our needs, and are afraid to give that which we have, then our faith is dead. It cannot profit, or save, the person in need. No glory is given to God, when we hide our light under a basket. If we say we have faith to lay hands on the sick and heal them, and never reach out and pray for and touch the sick and diseased, then our faith is dead. It does not profit, or save, the sick and diseased. Mathew 10: 7And as ye go, preach, saying, The kingdom of heaven is at hand. 8Heal the sick, cleanse the lepers, raise the dead, cast out devils: freely ye have received, freely give. Jesus wants us to be like him. He gave his life freely for us. And wants us in turn, to freely give to others. ← How to protect ourselves from a dangerous world. James says “faith without works is dead” in 2:20 and 2:26. He’s not talking about giving money to the poor – what a mangled exposition. Romans 4:5 says, “But to him that worketh not, but believeth on him that justifieth the ungodly, his faith is counted for righteousness.” That is New Testament Christianity by Paul’s gospel. Works will not save, only trusting Christ who died for our sins and rose again (1 Corinthians 15:1-5). So you have to “Study to shew thyself approved unto God, a workman that needeth not to be ashamed, rightly dividing the word of truth.” 2 Tim 2:15. Divide Paul from James. James never mentions one time that we are saved by Jesus Christ dying for our sins and rising again. James was killed at Acts 12:1-2 and didn’t live to be informed of Acts 15 – the gospel which Paul preached. James even addressed his epistle to Jews only (James 1:1) since it was written before a full understanding of the gentile church was known by the apostles. That said, we are saved by a work – we put our faith in Christ’s work. He had faith and works, and so he saved us. We only need to trust what he did – that is why Church-age salvation is faith only. But after the Church-age closes, what James wrote will re-apply doctrinally. Tribulation saints are not sealed permanently with salvation – they must “endure to the end” (Mark 13:13) to be saved. It requires work on their behalf to be included among the wise virgins. I stumbled across your comments to my article in my spam. After looking at your site, I am happy to see you and I disagree. The title of my article states faith alone is what saves us. A dead faith is one that is never used or exercised. Without a living faith Abraham would not have left out of Ur of the Chaldees. Rahab would not have received the spies with peace. Noah would not have been moved to build an ark. Faith in Christ is what saves us. A living faith is what we do with it. You are “happy we disagree” because a bold witness for the truth is always an embarrassment to a lukewarm Laodicean flake who longs for a good reputation in the midst of an evil generation. Although the phrase “living faith” doesn’t even appear in the Bible, your heretical claim that faith in Christ is not “living” is ridiculous nonsense. Since neither Abraham, Rahab, nor Noah were New Testament Christians, you obviously have absolutely no idea what you are talking about. Leave you home, hide spies, and build an ark and you will still go straight to hell. Why don’t you understand this …are you mentally impaired, or too lazy to study the Bible? hey mack my buddy!!!!! how are you doing this fine easter morning???????!!!! !….you ever hear the scriptures about the usage of our tongues,…….there is one about those who can not (do not) bridle their tongues,…God say that their religion is in vain,…what do you think that scripture means mack????? ?……..i’m thinkin about you,….after hearing the intentionally hurtful words that you have just said, or screamed, or “whatever?? ?” that was that you did,………..and the simple truth is this,……my heart honestly and truly goes out to you,….i say this in the most sincere way,……i truly do. i feel your pain and anger all too clearly,……and i am so sorry that you are hurting so badly……….hhhmmmmmm,………other than that,….i truly have no idea at all what to say that may be encouraging and healing to you, at all…….so, i believe i’ll just, “hold my tongue”,….jesus is so much bigger than the dead works of the law will ever be,….he knows exactly what you are thinking and feeling,……as well as “why” you hurt like you do………………….it is by God’s “GRACE” that WE “ARE” SAVED, through “FAITH”……and this faith has nothing to do with us,…. (NOT IN ANY WAY,…IN CASE SOMEONE MAY BRAG THAT IS)…..for FAITH IS….A GIFT,….FROM GOD…….mack,…a “GIFT” to us “from god”,…or from anyone else,….is free,….it costs us nothing!!! !,…..we do not have to “pay” for a gift,…..we do not have to try to “work” the cost off a gift off either,…..as a “gift” has no price to be paid……..by us as the receiver of the gift,……….jesus paid the price in full,……once and for all,……..for all of is………….he who is guilty of much, owes much,….but he who is forgiven much,….is free and loves much,………………jesus shed blood on the cross as the “propitiation” for all of our sins,…..is the only thing which truly frees all of us,….jew and gentile alike……faith in jesus,….IS THE “ONLY” THING THAT SAVES US,…….then,….through the indwelling of the holy spirit which then resides in us,…….jesus works through us as we abide in him,……HE,…does the work,….NOT US,……………mack,…..this is one of the hardest things for us as humans to grasp,…..it truly is,……satan is the one who tells us “falsely” that we have to do something good enough,….because satan knows that as soon as we “think” that we of ourselves have done something or anything good,…he uses our pride to blind further away from the cross,……………….mack,…i really do love you man!!!!! !,…………..i really do,…….and i am so sorry for your pain…….take care..
by the way mack,….here is “your” direct quote (which is in truth, an extreme misquote, btw)….”You are “happy we disagree” because”…etc,…MACK,..YOU ARE the one who said,…….”HAPPY TO DISAGREE”…….correct? and then, THE SECOND PART,….HE SAID THAT HE DISAGREES WITH YOUR VIEW……. and in christian love,…we can discuss scriptural differences with one another lovingly,…and god is glorified in this manner….pretty cool, huh mack???…. I am happy you are taking the time to check out my site. You are a very expressive commenter, take care. lol,….yeah,….i guess i am huh????? ?……i like being a cartoon!!!!!! where is our rest when we don’t even know when or where or how we have to work or not??? and “if” we are focused on our works,…to get us to heaven…then why did we need a savior in the first place?? ?…did jesus come to TAKE THE LOAD OFF??? or to PUT A LOAD ON US?? ?…did he pay the price for our sins to be forgiven in full??? or,….do we still owe him a couple of bucks?? ?…..more n a sec mack!!!!,…..thanks!!!! you have been a real inspiration to me!!!! not to mention an opportunity for my love for, and acceptance of other to grow!!!!! !,…..back soon!!!! You leave little doubt who your taskmaster is. “For if ye live after the flesh, ye shall die: but if ye through the Spirit do mortify the deeds of the body, ye shall live.” Romans 8:13. “To deliver such an one unto Satan for the destruction of the flesh, that the spirit may be saved in the day of the Lord Jesus.” 1 Corinthians 5:5. Whether you are saved or lost, either way God will have the devil afflict and kill your body if you don’t repent of your wickedness. So your choice is clear: Repent or die. If you are unsaved, you’ll go straight to hell afterwards. If you are saved, your soul will still go to heaven, but in nakedness and shame and rebuke to answer Christ in fear for why you spent your miserable life in sinful lusts. i see all of the scriptures that you are pasting here,….but along with your own words,….i see that you are trying to use the scriptures to hurt and wound,….not lovingly correct,…..why do you want to do this mack???? ?……what is it that you could “possibly think” that you can gain from doing this??? ?…..do you feel any peace at all in your life by doing this mack??? do you ever feel any rest??? or joy?? ?……how about love mack?? ?…..do you truly think, feel, and believe that you are loving us as you call us stupid??? as you call us fools??? is this the perfect easter sunday that you have always wished and hoped for??? i wish you knew what i am feeling at this moment,…..it is beautiful mack???? ?,…it really is!!! i’m just sittin here now being thankful and enjoying the peace that God has given me today,…but especially,…in this moment,…….while thinking of you mack……..i can’t even begin to explain how i feel,………..the bible speaks of a peace which goes way beyond our understanding,….well,…..i get it,……and it is good…………..
oh,…..another quick tidbit mack!!!! !……here’s a lil paste from what you wrote…..
A really cool and comforting thing about doing this is, it keeps us from quickly saying something that we may easily regret later,…you ever been there, Mack??? It’s not even a “nice place to visit”, is it?? ?…lol,…life is good!!! There is a movie called “JOE DIRT”,…you ever seen it??? in it, there is a scene where there is an oil field worker standing by a fire,…and due to being covered in oil and gas,….he bursts into flames!!!! funny stuff! Which is where why I am writing begins,…we as “christians” are quite funny, and peculiar critters, doncha think??? so Mack,…I’m just gonna ask you this straight forward ok???? ?…what is it EXACTLY that made the first words of “your” words of “encouragement” from above be “YOU DON’T GET IT.” ??? The reason that I ask is this…when a greeting, or in this case,…when an opening statement so direct and bold as yours is made, it hints (or states) that “you” get it,…whatever “it” may be??? ?…while telling someone else just how wrong they are. Do you see this Mack??? As near as I can surmise (that’s my pet word of the day, by the way! Lol) that we are “discussing” (????? ),…actually, there wasn’t a “discussion” at all, was there? Rather some “cut and pasted” scripture things…with no expounding upon most of the pasted scriptures?? ?….at least I think that is the black and white of it, right? ARE YOU A FAN OF THE BOOK OF PROVERBS MACK???? You ever seen that one??? actually, we see it in action in the new testament in the garden of Gethsamane,….when we let them,….the scriptures really come to life!!! !….check this out Mack! So,…the soldiers and religious guys come to get Jesus,…and take him away,…but,…Peter didn’t dig that idea at all!! !,….so,…what did Peter do Mack??? He whipped out his sword and cut off the ear of Caiphas’ servant!!! Remember??? What did Jesus say and do then Mack??? He told peter to put his sword away!!! Didn’t he?? ?,….then what did Jesus do??? Jesus picked up the ear of the servant dude,…and healed him by attaching his ear back to his body!!! Cool huh???…. I’ll tell what is so cool about it to me, Mack,…JESUS LOVES EVERY SINGLE ONE OF US!!!!,…right??? He even healed the ear of the guy who taking him to experience the single worst night of his life!!!….???? Jesus loves “nice” people,…and “not so nice” people…He even healed the ear of a total non believer??? And that guy’s “works” were not good at all, were they??? Not only did the once DEAF guy have to DO NOTHING,…but what he was doing wasn’t very nice at all,…was it??? But Jesus made him “whole” anyway. And JESUS didn’t tell him that he owed him a thing, huh??? so,…Here is one of Jesus disciples,…guys that knew to do good,…yet one of em cuts a dude’s ear right off!!! Lol oopsy!!! So,…Jesus reprimands the good guy,…and heals the bad guy??? Weird huh??? I got a funny feeling the “servant” felt “offended” by peter’s sword, huh?? More in a sec,…ok,….sorry Mack, I gotta do something real quick!!!! DID YOU EVER ASK YOURSELF WHY EXACTLY PETER WAS EVEN CARRYING A SWORD IN THE FIRST PLACE!!?!?!?!??!?!?!?!?!!???? ?…..does that seem a bit on the strange side to you at all???? ?…….was he thinking he was gonna have to kill a bear or somethin????? ?….he walked with a guy who could calm storms and walk on water, right?? ?…..if the boogeyman was gonna try to get peter,…don’t you think jesus could have dealt with it???!!!!!! !….so,….why the sword?????? ?……more n a sec…..
Hey Leon… Did you make that picture yourself – if you did (or who ever did) it is fantastic art! I love it! Hi, Yes it is great art. No, not original though.